Scuba Diving Belize Ambergris Caye - Dive In and Have Fun! On the must do list of many divers is scuba diving in Belize. Ambergris Caye is the most well known and popular island in Belize for some world class diving. It is more developed than it's sister island Caye Caulker, which is only 11 miles from Ambergris. If you are looking for a little more action than Caye Caulker offers but still want access to the same dive sites , Ambergris Belize may be for you. Ambergris Caye is the largest island of Belize and is about 25 miles long and 1 mile wide. Still a small island and easy to explore. Similar to what I said in my write-up about scuba diving in Caye Caulker, while Ambergris has beaches, I wouldn't come here if what you want to do all day is hang out on a beautiful beach. Similar to Caye Caulker, the beaches are not all that great, IMHO. There are much nicer beaches in the Caribbean if that is what you are looking for. There are 8-10,000 or so Belizeans living on Ambergris. More and more foreigners are buying places here so the gringo population increases the count while they are in residence. 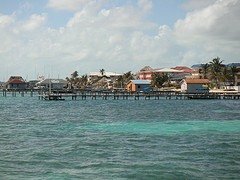 The town on Amergris Caye is San Pedro. San Pedro lies near the southern tip and most of the population lives in or near town. 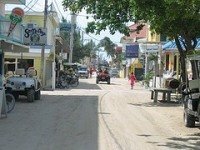 San Pedro, Ambergris Caye has 3 main roads that run parallel to the beach and reef. They have more tourist oriented names now but many of the locals still call them by their old names. The 3 main streets are Barrier Reef Drive (Front Street), Pescador Drive (Middle Street) and Angel Coral Drive (Back Street). To get a satellite overview and see the island, take a look at our Ambergris Caye maps. When we first went scuba diving in Ambergris Caye, Belize it was all packed sand roads. On our last visit there were paving stones on the main roads. I guess some would call it progress. The barrier reef lies just offshore from Ambergris. It is about a half mile east from the shore so boat rides to most dive sites are short. Belize itself is situated on the Caribbean coast. It is bordered by Mexico in the north, Guatemala to the south and west and the Caribbean on the east. Our Belize maps will give you a great overview. 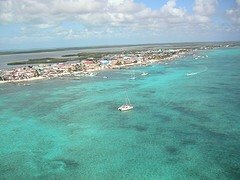 Ambergris Caye is located about 35 miles northeast of Belize City and 11 miles north of Caye Caulker. There is airport on the island with several flights a day from Belize City (Maya Island Air and Tropic Air). The flight is short, about 20 minutes, but beautiful. You can also reach Ambergris via water taxi from Belize City (or Caye Caulker). This is how we went. The ride from Belize City is about 75 minutes and is a fun way to get the island. There are a range of hotels to choose from on Ambergris. When we stayed on Ambergris, we stayed at a resort that has since changed hands. Since I haven't been to the resort since the new management took over, I can't recommend it one way or the other. I will say one thing though, since we first stayed there, there are alot more hotels to choose from. We were passing through several years later (I know that sounds funny, but we were catching a ferry and spent the day on Ambergris before we left) and the development and the amount of accommodations since we had been there blew us away. When we went scuba diving in Caye Caulker we also spent some time on Ambergris. It has certainly become much more developed, giving you more choices of places to stay. No matter what you are looking for - be it a small guesthouse or a more upscale Ambergris Cay resort - you will be able to find it. 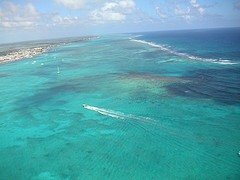 So pick whatever Ambergris Caye hotel or other type of accommodation that makes you comfortable during those surface intervals. Another option would be to go the rental route. Besides other hotels/resorts there are some good options for renting a house or a condo during your dive vacation on Ambergris. Airbnb has quite a few good looking listings. We use Airbnb all the time (both as guests and hosts) when we travel and absolutely love it. We love getting an apartment/house with a kitchen so we can at least have a refrigerator and have breakfast before we go diving. Depending on how long we are staying we will cook quite a few meals also. If you go this route, it could end up saving you a fair amount of money. Not to mention how much more comfortable you are in an apartment or house versus a hotel room. If you want to check them out, you can use this link for $40 in Airbnb travel credit when you sign up (for new accounts only). I will get $20 credit if you complete a trip - so thanks if you use it :). It doesn't change the price you pay. I haven't had a bad experience yet and I wish the same for you if you use them! Like the rest of Central America, Ambergris Caye has a tropical climate. Which basically means it can get hot and humid, especially in the summer months. Since it is only 11 miles from Caye Caulker, the 2 islands have the same weather pattern. The average daytime temperature during the summer months is typically around the mid to high 80's F with temperatures in the 90's F not that uncommon. Things cool off a bit in the winter months with average temperatures closer to around 80F. Belize and Ambergris Caye have a rainy season from June to November with the most rainfall occurring in the September-November timeframe. The island does get hit by hurricanes during the hurricane season (June-November also). According to hurricanecity.com the island is affected about every 4 years on average. Direct hits are about once every 15 years or so. So not as bad as some other Caribbean islands. Water temperatures around Ambergris Caye and Caye Caulker are actually fairly constant. In the winter months (December to February), the water is around 75-80 F.
It warms up a bit starting around April-May with temperatures from May-October in the 80-85F degree range. So if you go to dive Belize, you should be pretty comfortable underwater. My husband and I don't tend to get cold easily so many times we will just wear a skin when we dive Belize. If you tend to get cold 2mm shorties or 3mm full scuba diving wetsuits should be more than sufficient depending on your comfort level. Scuba diving in Belize Ambergris Caye - no drysuits needed here! Ambergris Caye Belize sits right off the second largest barrier reef in the world (the reef runs for 185 miles). The reef is only about a half mile offshore from the island so boat rides can be short, which is a pleasure. However, there are many places to go scuba diving in Belize. To the east of the barrier reef, there are 3 atolls which are popular spots for diving. These are the Lighthouse Reef, Glovers Reef and Turneffe Reef. If you go just out to the reef, some Ambergris dive sites are less than a 10 minute ride away. One of the most popular spots for scuba diving in Ambergris Caye is within the Hol Chan Marine Reserve which lies less than 5 miles from San Pedro. Dive shops on Ambergris Caye also offer scuba diving trips out to Turneffe Reef and the Blue Hole. These are much further out (and, accordingly, cost more) and entail a longer ride. Our ride to Turneffe Reef took about an hour over some rough seas. A bumpy, rainy, uncomfortable ride. If you go, hopefully you will have better weather. Well, I hate to say it, but we have been scuba diving in Belize off of both Ambergris and Caye Caulker and have not yet dove the Blue Hole. We signed up for it 3 times while we were in Caye Caulker but it kept getting canceled because not enough people were signed up to go. We even tried one day to go with a dive shop from Ambergris but noone was going out that day. You know what happened, of course. The day we were leaving Caye Caulker was the day there was enough people to go to the Blue Hole. Guess we just have to go back. If you do dive the Blue Hole, which is located in the Lighthouse Reef Atoll, expect a boat ride of about 2 hours. There is alot of variety in Ambergris Caye diving. You can do canyons, tunnels, wrecks, blue hole, etc. Since it is the most popular tourist spot and dive destination in Belize, there are alot of diver operators to choose from. Most hotels usually have or are affiliated with/recommend a particular outfit. While we were there we did many type of scuba diving - reef dives, wall dives, a wreck dive. There are lots of canyons that form great swim thrus. We saw a large variety of marine life during our diving. Sharks were a common sighting on a few of the dives. We also saw octopus, shrimp, lobster, eels, rays and much more. The visibility is typically in the 50-100 foot range. During out last trip there (in March) our average visibility was about 70 feet. All in all, I would rate diving here as good+ to very good. Considering the variety of diving you can do, the short boat rides, the marine life encountered and the topside atmosphere, a dive trip to Ambergris is something I will definitely do again. While Ambergris Caye is more developed than Caye Caulker (and getting more developed with each passing year), it is still a far cry from a Cancun. It is all about the scuba diving here. But Ambergris does have shopping and nightlife, especially compared to its more laid back sister island of Caye Caulker. So you can wander the streets and shops during your off hours. Don't expect Fifth Avenue, but you take what you can get. After we finished our scuba diving on Ambergris and were waiting to fly, we took a day tour. You go by boat and go up a river on the mainland and then are transported to Altun Ha, a Mayan ruin site. On the way back we stopped at a jungle spa for some lunch and massages. A great way to end a scuba diving trip. Photos by Jon Wiley and Geoff and Ana-Maria. Thanks!